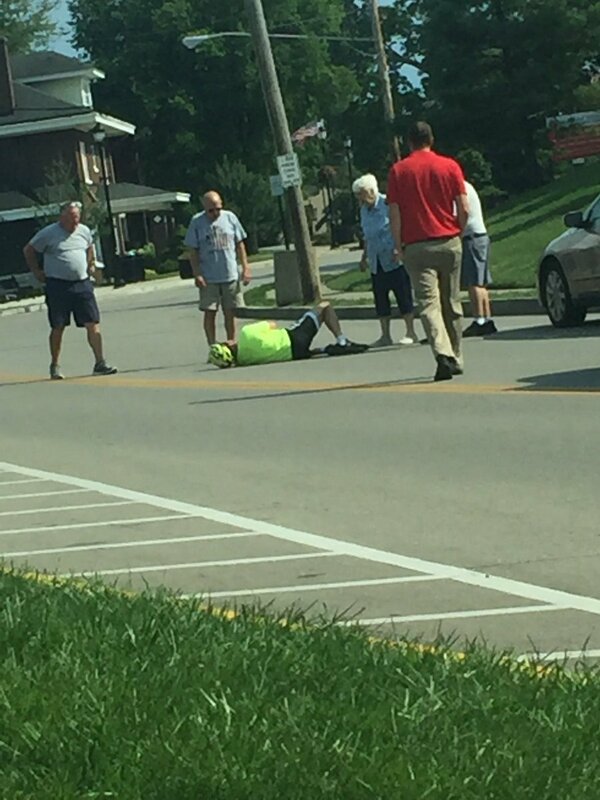 A bicyclist was struck today on Memorial Parkway in front of Highlands High School as a driver of a parked car opened their car door as he was riding by. The accident occurred today around 5:15 p.m. According to Fort Thomas Police Lt. Rich Whitford, the bicyclist was transported to the hospital for his injuries. Resident, Joe Seiter, witnessed the aftermath of the incident. "I came around the bend and saw him laying there and the elderly couple was walking up to him with their car parked a few feet away in the middle of the street, so it just happened right before I came around the bend. Then a few other folks rushed up to help," he said. "He sat up and was holding his leg and then laid back down in an extreme amount of pain." There was no update on the bicyclists' status. Accident? Fortunately, there's nothing that could have prevented it. Maybe like the cyclist riding away from the parked cars, but also maybe like the driver looking behind him/her to ensure the door wasn't going to make contact with a cyclist or other vehicle. "Accidents" don't just happen. Hey a$$&@!e. Not everything needs a comment. Crash NOT Accident. You are correct A Smith. Hey other anon. Not every comment you don't like needs a comment. To those few drivers that might read this, open your car door with your RIGHT hand. Forces you turn turn towards the area you will be affecting. Legally, it's the driver's responsibility. But yeah, smart cyclists don't depend on smart drivers. This is a great plan! It's the Dutch way, right? Cyclists must stay out of the Door Zone, approximately 3 feet from side of vehicle. Conversely, motorists must look before opening doors and have door open only so long as to enter or leave vehicle...NO LOADING AND UNLOADING FROM STREET SIDE DOOR!!! It is common sense. And in California, a code violation. Occurrences like this are exactly why we developed the "Check for Bikes" vinyl clings and bumper stickers. They are simple reminders that promote better awareness of cyclists by drivers. More info on Check for Bikes is at www.checkforbikes.org . Who in Fort Thomas wants to pick up some to distribute to your friends and neighbors? Email me at contact@checkforbikes.org - I look forward to hearing from you soon - thanks!